Phew, that was a first day and a half, wasn’t it? I’ve checked my wallet for wear and tear and noticed some early fraying around the inner pocket that hosts my debit card. I fear it won’t last the winter. 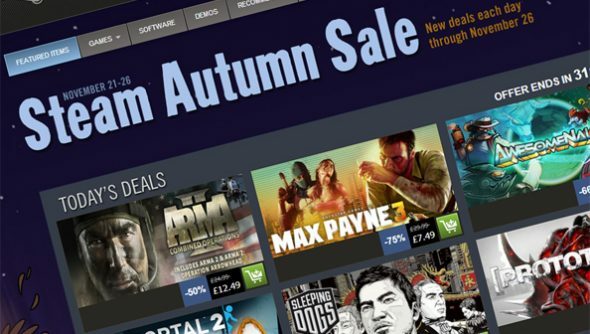 But the cash-blowing must go on: we’ve reassembled the PCGamesN Price Squad to assess the latest in Steam deals. Paul: War. War never changes. But the graphics do get better. The ArmA games never managed to bring me the delight that Operation Flashpoint did, but I can’t deny that they do a fine job of being often punishingly realistic military shooters. Now that most of the bugs are ironed out, they’re far more worth your while, but be warned, all the ArmA games are still a little wonky. Nick: Should I feel bad that I only picked this up for Day Z? NOPE! Pick this up, along with Day Z Commander and all that myth about this being the most frustrating to install mod is all but vanquished. Even with the standalone version of Day Z looming, I’m still having tons of fun with the original mod. My latest ramblings include stealing someones tractor and running them over with it, using a dead survivor to lure two bandits before killing them both, stealing said bandits quad bike and night vision goggles, watching one friend shoot another friend by mistake and finally crashing a van into a tree, resulting in the death of myself and three friends. Tim: I would probably wait for the standalone DayZ game, personally. But ArmA II is a great game in its own right. Nick: This like Darksiders 2 dwells within the 70% list of games I’m still to play in my Steam library. I don’t have a problem. I DON’T! Rob: Max Payne 3 is bound to split opinion. It is a pure shooter, but not a pure Max Payne game. You spend a lot of time in cover rather than bullet-time diving your way through room after room. It’s also less humorous than the first two games, and perhaps the story is a bit padded. None of that mattered to me when I played it. This is one of my favorite games of this year, a reminder of why I love this character and what is great about the linear shooter. For $15 it’s a steal. Be sure to stick around for the final act, which culminates in an airport shoot-out that became an instant favorite. Tim: For goodness sake. If you like PC games, but either haven’t bought Portal 2 already, or have a problem with paying buttons for Portal 2 then I think you should just leave our website right now. Paul: For reasons I can’t quite put a finger on, I don’t think Portal 2 is as good as Portal 1, but I still had a great time playing this. It’s got some excellent puzzles, some great humour and top-quality narrative. For £3.74, it’s definitely one of the stars of this daily sale. Nick: I was actually involved with the Portal 2 “Potato FoolsDay” ARG that Valve and a bunch of indie devs set up. It was a complete blast, really showing what the community can achieve when given breadcrumbs for clues. The game itself has some of the wittiest writing that Valve has produced. It’s exactly the same in co-op: GLaDOS is consistently rude. Jeremy: Portal 2’s about Peabody and Atlas for me – the co-op really is the most wonderful thing. It transpires that one of the side effects that comes free with an extra player is exponentially more complex puzzles. Four portals, innit. And all the while GLaDOS enacts mindgames in aid of, ah, competitive spirit. If you’ve a sibling or good friend lolling about, do this with your time. Tim: None of us have played this. But I’m going to buy it and play it, if only because I was following it when it was Activision’s True Crime game. And apparently, it’s very good. Paul: I find the Prototype games massively overblown in the exact same way that I find the Just Cause games massively overblown. They’re just big and silly and messy and I can’t quite connect with them. It’s probably a character flaw, as lots of other people have had fun with them. If you want to do that super-powerful, Akira-like wiggly-arm thing, be my guest, but I just think it looks like you’re waving giant worms around. Tim: I admire everything about Prototype. It’s a marvellous, and as Paul says, overblown open world action game, starring a man-mutant shapeshifter thing. But I don’t enjoy playing it one bit. I just don’t find the violence that entertaining. Maybe I am broken. Jeremy: Prototype devs Radical Entertainment were all but disassembled earlier this year, which was a real shame. For a decade they’ve been the most capable runners up in open-world game development. Their finest hour was actually 2003’s The Simpsons: Hit and Run, but you really ought to play this too and belatedly celebrate their brief ascendancy to the big-time. Paul: I will be astonished if any member of the team comes forward to say that they’ve played this. Jules: I’ve not played it, but it does have one of the twee-ist trailers I’ve seen and for that I tip my (engineer’s) cap. Nick: If you’re looking for mindless fun with up to three friends that involves zombies, this game will satisfy. I would avoid guns though because they made this game incredibly easy, but you could always ramp up the difficulty to compensate. Tim: The co-op on this looked a right laugh. Company of Heroes is my favourite RTS ever. It’s wonderful. It’s Band of Brothers: the RTS, basically – you take control of an almost perpetually doomed Company heading through Normandy and beyond. It’s exciting because a) everything explodes really, really well and b) even if it’s slightly forced into RTS mechanics, with build orders and such, out on the field, you’ll still be using proper military tactics and such: flanking, using mortars, toying with range-finders, and occasionally dropping a V2 rocket on your mates. Tim: I like the bit where you attach balloons to Doctor Kleiner and ride him like a Zeppelin. Paul: Garry’s Mod is just so much nonsense, it’s a toolbox for trolls, a sandbox for silly people and it allows you to fulfill all your slapstick fantasies. Here’s the thing, though: it’s not all that much fun to mess around in by yourself. It’s much more enjoyable when you can share the chaos of your creations with some friends, or work together on some ridiculous, jury-rigged project like a demented version of the A-Team. If you have time to waste and you like making things that fall apart, explode or go wrong, this is the mod for you. Tim E: We don’t know. Sorry. Metacritic thinks it’s 70% good. Paul: Meh. Sorry, but meh. Time trialling as a blob of meat isn’t my thing, but I gather a lot of people do love this. Personally, I’d wait for a Binding of Isaac deal to surface. That I can get behind. Jeremy: Ed McMillen likes to say that he played it safe with Meat Boy, and he did – but only by his own seriously twisted standards. Super Meat Boy is the slickest indie game you’ll play outside World of Goo. It’s wet with precision platforming and indie self-reference. It’s also possessed of the best soundtrack you’re likely to hear in ages, which sees composer Danny Baranowsky dusting off Tommy Tallarico’s Earthworm Jim LP before totally shredding it with a sick keyboard solo. Paul: I will never learn how to spell this game’s name properly, but I love the premise. As the owner of a twee anime bric-a-brac store, you’re alternately selling all sorts of strange and wonderful things to pay off your colossal debts, while also adventuring to add to your stock of oddities. It’s very cute and very silly and very juvenile, but it’s also damn hard and surprisingly addictive. This is the sort of thing we PC gamers just don’t see enough of and I’d like to think that, if you pick up a copy of Recettear, you’re taking one small step towards changing that. Paul: That’s right, seventy-SIX percent off. Going that extra mile. Have any of you fine fellows played this? Anyone? Jeremy: I haven’t, but I am buying this. Rarely do I play games in a conscious bid to learn anything other that their own insular mechanics, but Rock of Ages promises both fun and art history. Tired of your visual arts reference points beginning and ending with BioShock-gleaned art deco? Me too. Jules: Hard Reset looks stunning. The opening level has you moving through rain-slick, Blade Runner-esque streets; neon reflects off puddles, sparks fly from broken panels, and your weapons are awash with complex animations and particle effects. It really is just a pretty face. The shooting is dull and while there are a variety of enemies they only vary beyond looks by the amount of health they have: all the ones I encountered charged at you till you shot them dead or they killed you. That said, I played this game at release and there has been some monster patching since then. For this price it may be worth a look. Paul: I am really good at Frozen Synapse. Seriously, I have a great win-lose ratio. Therefore, I think this is a pretty good game. If you buy it, you can find me and challenge me. If you dare, that is, because this game is PURE TACTICS and totally uncompromising. For all the planning and plotting that players engage in, I’ve still seen so many games in end just two or three brutal rounds. When you win a match that way, you feel like you’re in command of the most kick-arse SWAT team history has ever seen. Jules: I am really bad at Frozen Synapse. Seriously, I don’t think I’ve won a game, ever. This isn’t because the game is unfair in any way, it’s because I can’t out-tactic a child. It is a pure, refined game and if you like challenging children to gun battles you should definitely get a copy. Jeremy: Jules slaughtered me on XCOM last night, so it’s safe to assume I couldn’t out-tactic a tictac. Nevertheless, Frozen Synapse was my favourite game of… last year? Has it been so long? It’s the leanest tactics game you’ll ever play, with every outcome calculated in binary. It happens like this. Two men meet in a doorway, both wield shotguns, both are crouching. But one is moving and therefore hasn’t had time to prepare his shot as well as the other guy. That man is dead. I’d also like to sing the praises of its underappreciated single player campaign, if you’ll let me. The writing and characterisation is whip-smart, and I’m still left smarting. It’s the tale of a city, of Silicon Valley fall-outs turned civil wars, of tech companies as cults. It’s about Google and Apple, and its villain is an amalgam of Steve Jobs and Mark Zuckerberg. It’s really, really clever. Jules: Although I’ve not played the newest Serious Sam I can confidently say it is the same as the first two but with MOAR. MOAR GUNZ. MOAR GRAFIKS, MOAR BADDYS. If that floats you BOAT then MOAR BUY BUY BUY. Tim: This is a lovely little indie 2D platform puzzle game. The central conceit and mechanic is that water can be turned into friendly little worker things. You spend a lot of your time yanking on chains and faucets to direct water around the various levels. It’s calming, not at all violent, and soothing. I think it’s great. Tim: We haven’t played this. It’s a Match 3 game that uses your music library. Reviewers seem to quite like it. Paul: Bit of an acquired taste, this one, but fascinating nonetheless. You play as the leader of a country, having to balance your own political outlook with the interests and demands of your citizens. Democracy 2 is a little like spinning plates, but finding out that all those plates are connected to other plates in what can be obtuse and bizarre ways. Perhaps some of the plates are metal and a few are magnetic, or maybe some of the plates are just jerks and like to punch other plates. Look, I don’t know, but I do know that Democracy is a fascinating management balancing act, although for some of you it will be exactly as boring as that might sound. And so finishes today’s round-up. One last thing – don’t forget to check our Steam Sale survival guide before heading out there. Good luck.